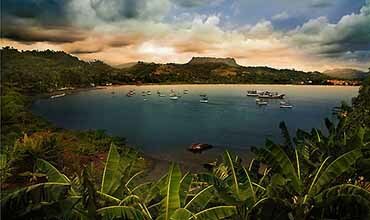 Top rated tourist attractions Baracoa, Cuba. Declared Cultural Heritage Site by UNESCO, this park is located in the heart of the Biosphere Reserve Frijol, 40 kilometers northwest of Baracoa. 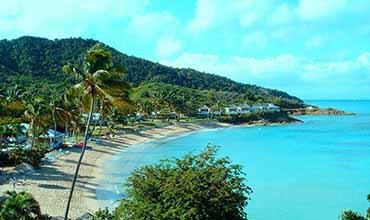 Known as the best preserved mountainous ecosystem in the Caribbean. According to UNESCO "one of the tropical island sites most biologically diverse in the world." It was named after German explorer Alexander von Humboldt, who first arrived in 1801. Visit the old Seboruco Castle, turned today into a hotel, and enjoy the amazing views from its overlook. Seboruco de Santa Bárbara Castle, Baracoa. Seboruco de Santa Bárbara Castle. 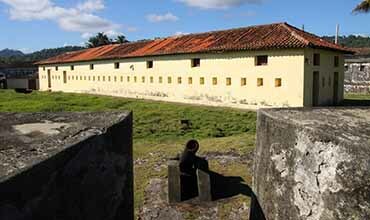 The Seboruco Castle is one of the three fortresses of the defensive Spanish system raised in the city of Baracoa. This construction was the most important one for the defense of the city due to its strategic position, since it is located in a hillside, more than 100 metres above the sea level. The well-known castle served as the control of the Baracoa Bay. Its construction dates from the 18th century, began by the Spaniards in 1739 and finished by the Americans in 1900. Due to its old defensive functions, it was declared National Monument in 1978. In the decade of the 70 in the 20th century, the Seboruco Castle became a hotel and nowadays keeps offering these services under the name “El Castillo” Hotel. As a characteristic, the inn counts with an overlook which shoes beautiful panoramic views of the bay, the city, the Miel River and the Yunque. Furthermore, from the end of the castle you can see the Bella Durmiente, outline formed by the mountains of the Toa Range. Visit the welcoming Catedral de Nuestra Señora de la Asunción Church and admire the Parra Saint Cross, the first symbol of Christianity of the area. The Catedral de Nuestra Señora de la Asunción Parish, belonging to the Catholic Church, was built in 1803 in the central park of the city of Baracoa. Its initial structure has suffered successive transformations until in 1905 it acquired the distribution known today. Nowadays, it has been under an important restoration, but it can still be visit the relic hidden on its inside, the Parra Saint Cross, which according to the legend is the one planted by Christopher Columbus on its arrival to this lands, becoming the first Christianity symbol in the New World. If it is true that the proofs of the 14 Carbon the date of the end of the 15th century, the wood seems to be indigenous of Cuba, which will discredit the Columbian legend. Visit the memorable church which is part of the touristic tour in the historic center of the city and admire the Cross which proves the evangelist missions of the first conquests. Enjoy an extraordinary visit to the Cueva del Paríso Archeological Museum, near the overlook of El Castillo de Seboruco Hotel. 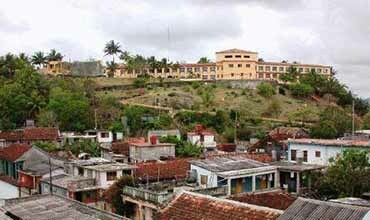 500 meter far from the Castillo Hotel, in Baracoa, you will find the area of the heights of Paraíso, where it is located “Seboruco Terrace”. Classified as phreatic origin, the fascinating Cave Museum is divided in three rooms where you can appreciate the forms of life, objects and pieces belonging to the first inhabitants of the area. You will have the chance to admire the representation of a Taíno village, just as a completed burial with the respective funerary offerings. 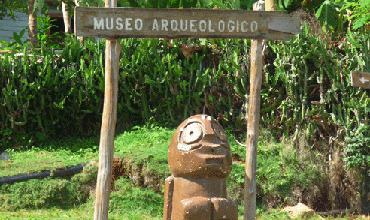 This original and beautiful museum will allow you to make a historic-archeological tour which will make you travel to the ways of life of the first Taíno civilizations of the area. Go on a trip to this peculiar mountain with the shape of an anvil and enjoy its nature. The Yunque is a mountain which is found 10 km away from Baracoa, located in a protected area. This formation, which is seen from every point of the city, this part if the biosphere of Cuchillas del Toa, getting the category of Outstanding Natural Element. With a height of 560 meters, its characterized because its top is flattened due to the erosion, reason why Christopher Columbus described it as a work anvil to hit metals. In addition to these archeological Taíno remains due to the settlement of indigenous groups, the area of the Yunque hosts a rich variety of flora and fauna, which have given rise to be declared as National Monument in 1979. Do not miss the opportunity of exploring one of the most characteristic mountains of the oriental area of Cuba and admire the exotic landscape it encloses. Have a walk through the José Martí Park and its surroundings and enjoy the cultural, political and commercial life revolving around the beautiful square. 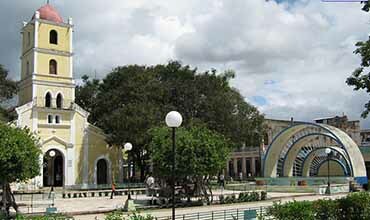 The Parque José Martí (José Martí Park), located in front of the Iglesia de Santa Catalina de Riccis Church, is one of the most outstanding spaces in the city of Guantánamo. Also known as Central Park, on its beginning it was named Weapons Square, because it was the place where the Spanish army did their military exercises. At the beginning of the 20th century started to be sowed different plants which, bit by bit, transformed the square into a park. In 1930 it was raised in the square, in front of the paris the statue of the Major General Pedro A. Pérez. The park, along the decades has been suffering different transformations, among which stand out the built of the known shell and a fountain raised for the plays of the Municipal Band, with half underground public restrooms, and which is standing since the middle of the 50s. At one side of the church is set up the “Martian corner”, made by a monumental seated figure of José Martí, in honour of the Apostle. 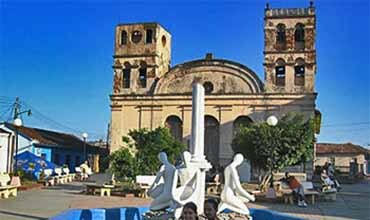 Have a walk by the beautiful square on your visit to the Iglesia de Santa Catalina Church and have a look at the Cuban life in the amusement center of the city. Rest in this little quiet beach very closer to the city of Baracoa. The beautiful playa Blanca is set up in the suburbs of the city of Baracoa, just two kilometers away from the city. This way, you can enjoy it after a calm walk from the village and crossing the Miel River. The characteristic thing of the charming white sand, crystalline waters beach, is that you have to pay the admission on the control post located in the access to the area, because it is enclosed on the inside of the protected reservation. 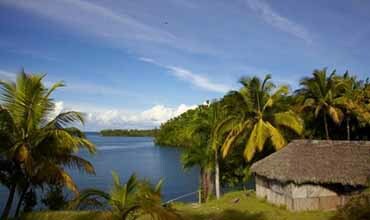 Discover this idyllic tropical white sand beach a few kilometers far from the city of Baracoa. 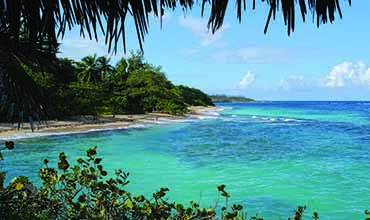 The Maguana Beach, located around 20 kilometers North from Baracoa, is the perfect sample of a tropical beach. This delightful beach is characterized not just by its reluctant white sand of its shore, but for being surrounded by palm trees and counts with quiet turquoise waters, result of the protection brought by the beautiful coral reef located very close to the coast. It is a very popular beach among the natives and the visitors and it has a nearby welcoming hotel, Maguana Village, where you can spend your calm and beautiful beaches. Visit the Plaza del Mercado de Guantánamo Market Square and go over the monumental building discovering the architectonic value it encloses. The Plaza del mercado de Guantánamo Market Square, designed by the architect José Lecticio Salcines from 1914 on, is one of the most representative edifications of the eclecticism of the city. The building of the Plaza del Mercado Market Square has an important architectonic value, as it is shown for example in the ribbed cupolas, which get the attention of every visitor. The place was though in the 19th century with the aim of creating a food market which ended up the hawkings. This wish came true in 1921 under the rule of the major Manuel Medrano Castellanos. 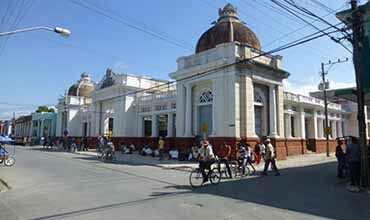 The building presents a lower roof with rectangular structure with four areas dedicated to the commerce and gone across by pedestrian streets; while the roof is crowned on its outside side by a sculptoric compound with Neoclassic style and mythological themes which symbolize the chant to the prosperity and developments. Also, it can be seen the shield of the city compound by an anvil, a shovel, a rope, two wheels and an anchor, representing a praise to the work as basis of the progress and well-being of the people and the happiness of life. All the compound has a parapet formed by lattices made in the age when the city has a more economic advantage and the target of modernizing the environments. Explore the fauna and flora of the known as Cuba’s Amazon and discover the widest river of the island. 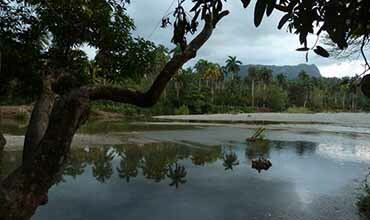 The Río Toa, name which means ‘frog’ in indigenous language, is located 10 km Northwest from Baracoa. It is born in the Chuchillas Nipe-Sagua-Baracoa and it flows into the city of Baracoa. The Toa is characterized because it is the widest river in Cuba and where 71 tributaries flow into. With a length of 130 kilometers, it constitutes the habitat of a great number of plants and birds. Also standing out, it has its depth and its lushy woods which runs through, by what is known as "Cuba’s Amazon". Enjoy an ecotourism day by one of the most significant spots of Cuba.